This is the book that bit me and gave me the gardening bug. It ain't your mamma's gardening book. Gayla was a "young, frugal urban gardener with no permanent space and only a sweltering hot deck to (her) name." She found there were no resources aimed at people like her, not even online, so she started yougrowgirl.com and a forum back in 2000. Sadly, the forum is gone now, but it was excellent and very helpful to people like us - those urban gardeners with little space and limited bank accounts. The book is a fun, easy read with many photos and illustrations. It covers the basics of planning, growing, and of course addresses the challenges of small-space gardening. There are all kinds of fun, crafty recipes and DIY ideas, as well as important recipes for organic pest and disease fighters. Best of all, it just makes you feel like you can be successful no matter how small your space. 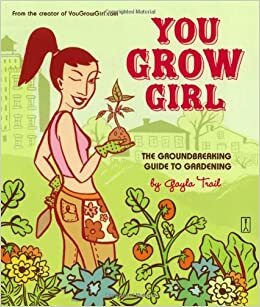 This book would be an excellent gift for a daughter, niece, young friend, or anyone interested in gardening in tight spaces. I still enjoy flipping through it every winter.